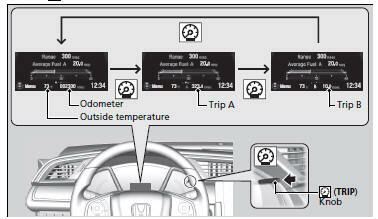 The driver information interface shows the odometer, trip meter, outside temperature indicator, and other gauges. It also displays important messages such as warnings and other helpful information. Press the (display/information) button and press or to change the display. Press ENTER to see detailed information. You can edit, add, and delete the meter contents using the audio/information screen. You can change when to reset the average fuel economy. Shows the time elapsed since Trip A or Trip B was reset. Shows the average speed in mph or km/h since Trip A or Trip B was reset. You can change when to reset the average speed. Adjust the temperature reading up to ’5’F or ’3’C if the temperature reading seems incorrect. 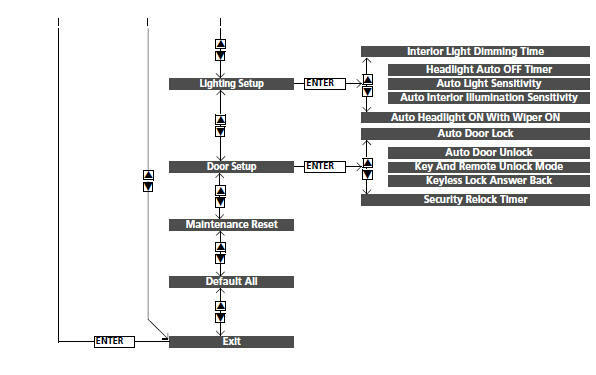 Use the driver information interface’s customized features or audio/information screen to correct the temperature. When the turbo charger is producing boost, this meter shows the boost pressure. Shows you turn-by-turn driving directions to your destination linked with the navigation system. You can select whether the turn-by-turn display comes on during the route guidance. Shows the current mail information. Shows the current phone information. Use the driver information interface to customize certain features. 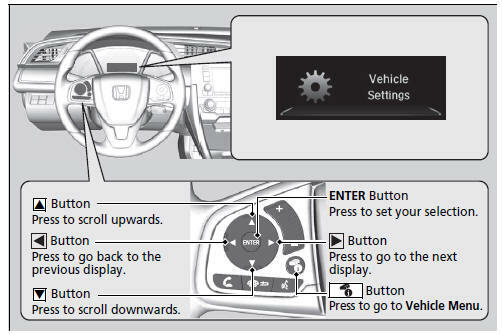 Select the Vehicle Settings screen by pressing the button while the ignition switch is in ON (w*1, and the vehicle is at a complete stop. Select Vehicle Settings, then press the ENTER button. To customize other features, press the / button. Keyless Lock Answer Back LOCK/UNLOCK- The exterior lights flash. 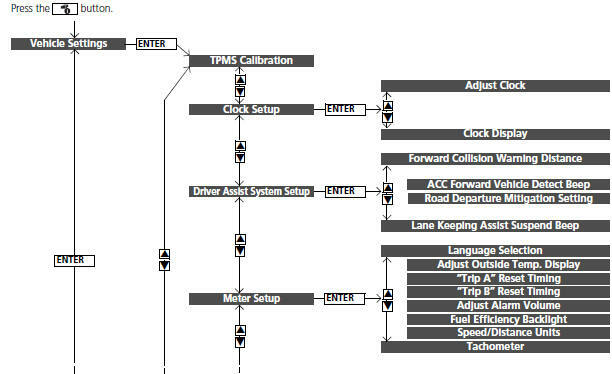 The steps for changing the ’Trip A’ Reset Timing setting to When Refueled are shown below. The default setting for ’Trip A’ Reset Timing is Manually Reset. 1. Press the button to select Vehicle Settings, then press the ENTER button. 2. Press the button until Meter Setup appears on the display. Language Selection appears first in the display. The display switches to the customization setup screen, where you can select When Refueled, IGN Off, Manually Reset, or Exit. 5. Press the button and select When Refueled, then press the ENTER button. The When Refueled Setup screen appears, then the display returns to the customization menu screen. 6. Press the button until Exit appears on the display, then press the ENTER button.